Last revised May 21, 2014. See Electric Würms live news here and updated album release details here. Still not finding the information you’re looking for? 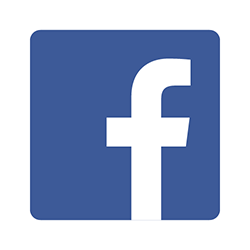 Ask in the comment section below or on facebook. Now a year later Drozd and Coyne have finished a 6 song debut primarily recorded with members of Linear Downfall, though involvement from MGMT and Daniel Huffman (aka New Fumes), as well as Lips bandmates Derek Brown and Matt Duckworth, have also been teased. Will they be on the record? Steven toyed with and tweeted some ideas last spring, but the project didn’t start in earnest until he and Wayne teamed with Linear Downfall in mid-August to record a cover of Yes’ “Heart of the Sunrise.” The Flaming Lips have discussed tackling this mega-jam for a while and it makes sense they would finally get around to it with Linear Downfall – the perfect group of musicians for any and all psych-prog side-project needs. And as you may recall, Linear Downfall covered “21st Century Schizoid Man” on “Playing Hide and Seek with the Ghosts of Dawn,” The Flaming Lips and Friends complete remake of King Crimson’s debut album. For the non-prog geeks reading this, the reason this is significant – Yes guitarist Steve Howe admitted that “Heart of the Sunrise’s” main riff (written by bassist Chris Squire) was based on “21st Century Schizoid Man.” “I suppose we got away with it,” Howe said in 1992. Even without this acknowledgement to his prog peers the similarities are obvious to anybody familiar with both tracks. Yes also seem to have inspired the bands name, or at least the second half of it: Würm is the title of Howe’s guitar freak out section in their 1971 classic “Starship Trooper.” Which brings us to…the umlaut. Yes were one of the first bands to hook fans with these phoenics and Drozd is among the many to follow in their path, previously using this linguistic device common to Germanic languages and metal bands alike on “Pompeii Am Götterdämmerung.” Stylized spelling aside, the term “electric worms” describes the squirms of light that wiggle through the cords draped around Coyne’s podium in the Lips’ Terror tour stage setup. It seems Steven is at his proggiest when his inner German shines, even if only with a wink – and that is the other way “Pompeii Am Götterdämmerung” forshadowed Electric Würms. DEO Creative introduced a logo for the project on their website last June (above right), complete with two more umlauts and quasi-German. “Der Schüren Gewalttätigkeit” it read under the band’s name (rough translation: “The Stoke of Violence”). Around the same time as the logo appeared a website registered to electricworms.com was “under construction” (though it now looks abandoned altogether). And although the title of the Electric Würms debut record hasn’t been confirmed yet, it appears to be Muzik Die Schwer Zu Twerk, a broken German translation of the hashtag Coyne has added to many of his social media posts about the project: #musicthatishardtotwerkto. Wayne first used the #musicthathishardtotwerkto hashtag at the start of January 2014, around the same time Miley Cyrus started tweeting at him. Wayne has continued to use the tag on his instagrams about Electric Würms since, and more recently on a picture of Miley “vomiting diamonds while singing Lucy In The Sky...” for the Lips and friends’ complete album remake of The Beatles’ Sgt Pepper’s Lonely Hearts Club Band. Does the hashtag suggest Miley is part of the Würms? 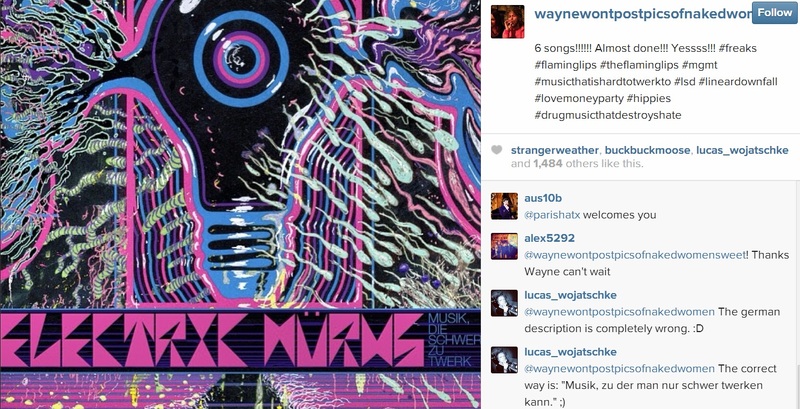 That Wayne’s Electric Würms posts also occasionally include #lovemoneyparty – the hashtag he uses for his collaborations with Cyrus and the title of one of her songs – further implies this possibility. Then again, maybe it’s saying the opposite: Electric Würms recordings are the polar opposite of the Lips’ recent projects with Miley? Perhaps “music that is hard to twerk to” is meant to say that both Miley and her twerking tunes have nothing to do with his Würms work. Miley too or not to Miley, that is the question. Whatever the answer, Coyne stirred up more speculation on March 19th with the above “electric sperm” image hashtagged with usual suspects (#freaks #theflaminglips #flaminglips #lineardownfall #hippies) as well as tags referencing Miley (#musicthatishardtotwerkto #lovemoneyparty) and haters’ responses to his love for her (#drugmusicthatdestroyshate). (Click on the picture for a larger view.) Most significantly it’s also tagged #mgmt. Was Andrew VanWyngarden’s recent work for Coyne’s Sgt. Pepper’s remake double duty for the Electric Würms debut as well? Is Ben Goldwasser on the Würms record? Is the tag just a joke, perhaps referring to the 2009 Lips track MGMT appear on, “Worm Mountain”? Last August Linear Downfall’s Chance Anthony Cook posted the below photo of himself recording with Steven, captioning it “Mr. Drozd and I putting down some tracks! !” Here’s another way to describe it: two starship troopers, exploring new frontiers with pink-strapped guitars. “Playin bass in Electric Wuürms!!! On the easy tracks!!! !” Wayne wrote on instagram last December referencing their cover of Traffic’s “The Low Spark of High Heeled Boys,” a jazz-rock milestone. They also recorded a “Diplo inspired version of The Planet Of The Apes Theme” and jammed on the groove best known as “Sivad” from Miles Davis’ Live-Evil (though that track is actually a mash-up of the end of Miles’ early fusion period set opener, “Directions,” with “Honky Tonk” – both primarily edited from Davis’ December 19, 1970 second set at The Cellar Door). Yep, that was the night John McGlaughlin sat in. For the Würms version Wayne said lyrics by Mother Teresa were added. Steven told Rock Sucker in March that the Electric Würms debut record, “will have a Yes cover on it that people might or might not like depending on which side of the punk rock/prog rock coin you exist on! I think it’s possible to exist in both plains, but some people feel like it has to be an either/or situation (laughs). But we’ve really tripped out hard to “Heart of the Sunrise” by Yes and we’ve done a couple of other songs. Then we’re going to try and do a whole record, so there’s a lot going on.” Since that interview Coyne confirmed they’re “almost done” with a “6 song“ debut, and Linear Downfall confirmed the record was finished at Tarbox with Dave Fridmann. Almost to OKC really honored to be working with our friends The Flaming Lips again! !